Three years after her explosive exit as Lianne Holliday in HOLLYOAKS, Jessica Forrest is set to make her stage debut with CHIP SHOP CHIPS, a funny and nostalgic new tale of love set over fish and chips. The 25-year old actress from Pendle, has appeared in a number of TV shows over the past few years including HOLLYOAKS (2010-2013), ITV’s CORONATION STREET (2014), Sky Arts’ THE CRUISE (2014) and BBC’s DANI’S CASTLE SERIES III (2014) but is now looking forward to making the move from screen to stage with CHIP SHOP CHIPS, a new play commissioned by Box of Tricks and written by Becky Prestwich. Focusing on love at different ages, CHIP SHOP CHIPS tells a story of first love, nostalgia and the nation’s favourite food and is set during the grand reopening of Booth’s Fish & Chip Shop. Jessica plays Jasmine, a bright, beautiful and bored 18 year old who visits the chippy with her Nan, Christine and stars alongside Rochdale actor Ben-Ryan Davies, best known for playing Ronan Burlesy in WATERLOO ROAD, as well as Russell Richardson (A WINTER’S TALE) and Julie Edwards (BRIEF ENCOUNTERS). Frankly My Dear UK caught up with Jessica ahead of the play’s premiere at The Hub in Salford (in association with The Lowry) on 17 February to find out how she’s feeling about making the jump from screen to stage. Performing on stage is a world away from the world of television, where Jessica developed her acting career. The former Burnley Youth Theatre member was studying Drama and Screen Studies at the University of Manchester when she was selected from thousands of hopefuls to play Leanne Holiday on Channel 4’s hit soap HOLLYOAKS. But despite being out of her comfort zone, the actress is enjoying the working in the theatre, particularly the preparation and rehearsal process, something she never got to do when working in TV. Jessica admits it’s taking her a bit of time to get into mindset of playing a teenage girl. CHIP SHOP CHIPS is to open Box of Tricks 10th anniversary year and is part of three new plays produced by the Manchester theatre company, all performed in different ways. Alongside a six-week national tour of PLASTIC FIGURNES and a run of NARVIK at Liverpool Playhouse Studio (in association with Liverpool Everyman & Playhouse), CHIP SHOP CHIPS will tour in some unusual venues across the North including village halls, community centres and libraries. The idea is to bring the play to audiences who usually wouldn’t attend the theatre by tempting them with a dinner, a dance and a show, all rolled into one! “It’s not just a show, you get a chippy tea, you get to take part in a quiz, there’s loads of little things” explains Jessica. The prospect of performing in some unusual locations to connect with the audience is one of the reasons Jessica chose to audition for the play. Rehearsal for CHIP SHOP CHIPS only started last week but it has already given Jessica a taste for theatre life. “I would absolutely love to do more theatre. I love it” comments Jessica. 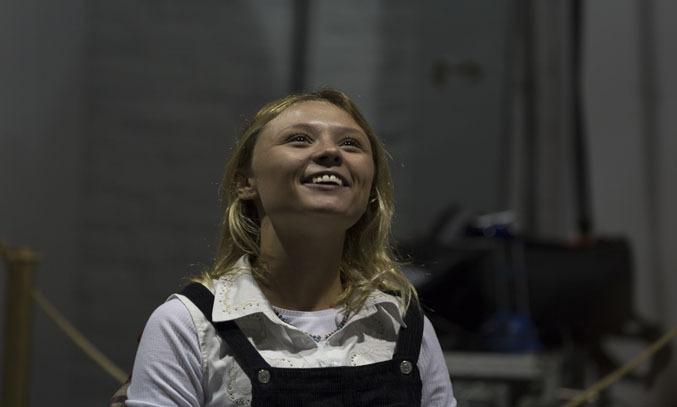 Jessica Forrest makes her stage debut in CHIP SHOP CHIPS which makes its premiere at The Hub in Salford from 17 to 18 February before heading out on tour until 23 March 2016. Visit Box of Tricks for the full tour list and to book tickets.